SleepBetter, the marketing subsidiary of Carpenter Company, sells two mattresses featuring Carpenter's Isotonic memory foam. The higher level model is the Isotonic TheraGel 10-Inch Thick Mattress. The support core of the TheraGel mattress is 7" of high-density polyurethane foam. 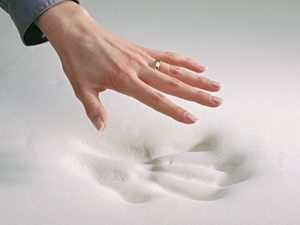 This base foam provides primary support for the mattress. It stabilizes the softer top foam with enough give to let it work as designed. The support of the base keeps the comfort layer from bottoming out. This dual role prolongs the life of memory foam. The top 3" of the mattress is Carpenter's Isotonic memory foam. It is infused with microbeads of TheraGel. This micro-encapsulated liquid gel absorbs heat to keep the mattress from overheating. The TheraGel Isotonic foam's 5-zone Active Air Technology™ (open-cell structure and ventilation pores) is designed to let air flow through. This is to allow absorbed heat in the gel to dissipate. It also helps control moisture. The cover of the SleepBetter Isotonic TheraGel Mattress is a knit of rayon microfiber. The microfiber draws moisture away from the sleeping surface. As the drawn-out moisture evaporates, it adds to the cooling. SleepBetter calls this an "easy care" cover. It can be spot cleaned. 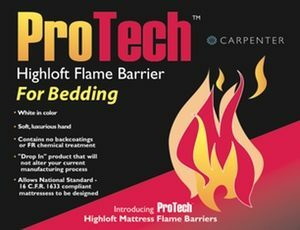 The Isotonic TheraGel Mattress meets federal flammability guidelines with its ProTech fiber. This is rayon infused with silica. When it melts, it blocks the flames. The SleepBetter Isotonic TheraGel Mattress is available in four sizes: Twin, Full, Queen and King. It is sold online through Bed Bath & Beyond. The suggested foundations are a platform bed or a slatted frame (sold separately). It can also be used with an adjustable bed. The manufacturer's warranty is for 10 years.